Recently, some phone manufacturers try to prove that there are people who don’t care about the global economic crisis. Otherwise, how would you explain the announcements of products such as the new models of Gresso, Mobiado and Vertu? 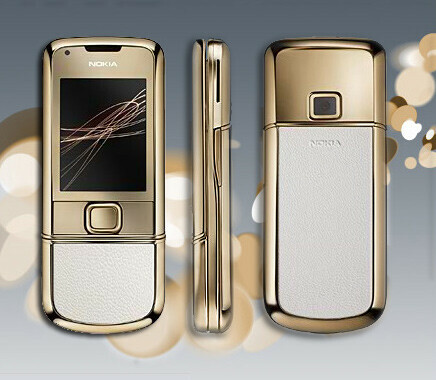 Nokia also joins in the game, with a new luxury model for its 8800 Arte series. The new addition is named Gold Arte and looks like a gold-plated Sapphire Arte – it has (white) leather on the front and back. Its specificatiosn are identical to the newer Carbon Arte, with 4GB of internal memory. A memory card slot is still missing, but we should remember that it is all about the 18-carat gold plating and the luxury feel, not about the features. There is no information on its price yet, but having in mind the precious metal, we guess it will be more expensive than the Carbon, which is around $1350. THATS THE MOST BALLER S**T EVER!